Jerry pointed me to an eBay item which shows an EP with two Hit of the week recordings. 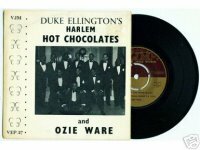 It contains the two Harlem Hot Chocolate recordings; the only Ellington recordings he made for Durium. Should it be part of my collection? As a fact I do have these tunes in my collection several times. As an original of course, but also on LP ( 2 times), cassette ( 5 times), on CD or CDR ( 12 times ). Wil je hem nog steeds niet? Jerry asked. No I guess I don't need this item. I just saw a message you posted on an internet site about choro and the film Brasileirinho. 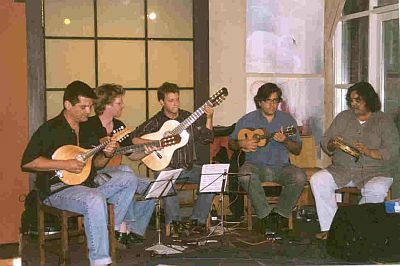 I am Brazilian and I have been living in Amsterdam for a couple of years and I make a website about Brazilian cultural events in the Netherlands ( http://www.brazilie.net ). You wanted to know if there are groups that play choro here and there are a couple. 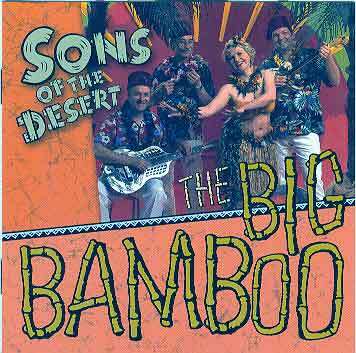 One of them is Choramundo, that will be playing on March 7th at the Roode Bioscoop in Amsterdam. They are really good. I highly recommend! I couldn't find an image of that band Choramundo, but you'll find their web site with a lot of info under the title http://fakhouri.sites.uol.com.br/ . Thanks for the info Mariângela !! 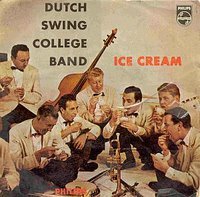 I'm hoping that out there is another 'Banjoist' who started after hearing Arie playing 'TAKE YOUR PICK' with the Dutch Swing College Band......why? Well, in one of our many house moves (well, you have to move often when you play banjo! )....I lost my record of Arie's version of that tune. It was a kind of talisman for me,....I can STILL remember the excitement I felt when I heard it LIVE in Glasgow..... and..... it was one of the proudest moments in my life when I could play MY VERSION of 'Take your pick'! 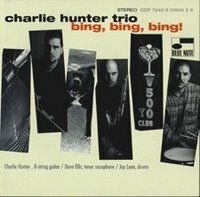 Does anyone still have an LP or cassette of DSCB with that title on it? I'd be happy to pay whatever....or, if you wanted to have the LP or Cassette copied to computer...and 'cleaned'.....Clicks and noise removed etc. and then burned to CD....I'd be happy to do that in return. Regards, JOE GORDON. Last year I bought some EP's at a junk market for our local sport club and one of it had a beautiful 1950s cover. I bought it, but .... back home the record was missing ..... So: sorry Joe. I really miss that record too !! 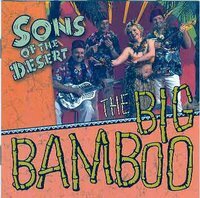 Some days ago I received a cd of the so-called Sons of the Desert, a Munich (Germany) based group that plays blues, swing and Hawaiian music. It's already their third cd and it sounds great and reminds me to the music of bands like the Dutch Gangbusters ( Frenk van Meeteren - Ton van Bergeyk - Gert-Jan Blom and Roland Brunt )or the 1930s Roy Smeck recordings. Listen to two music files I found on their web site: Na Moku Eha and the delicious out-of-tune version of Blues My Naughty Sweetie Gives To Me. I'm anxious to hear their first two records. Thank you Leopold for this musical surprise. 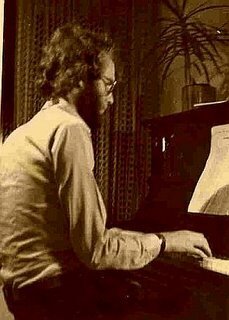 That's me, somewhere in the 1960s, playing the piano - trying to imitate the boogie woogie masters (like Albert Ammons and Meade Lux Lewis) or playing stride ( like Fats Waller, James P. or Eubie Blake). The old masters would have smiled. Fats Waller was my first idol. Together with Hans van der Veer I collected all RCA Black & White""The Complete Fats Waller Recordings". We started to make a Fats Waller discography, unknown that Laurie Wright should publish his ""Fats" in Fact" in 1992. Thanks to the fact that Hans van der Veer worked at Philips in Eindhoven ( The Netherlands) he could buy cheap reel-to-reel tapes for my Akai taperecorder, and due to the fact he earned some money he could buy most of the Black & Whites and tape it for me. So my first "complete" collection was the Fats Waller musical heritage. Nice detail: Some years ago I found the two RCA Fats Waller Memorial LP sets at a reasonable price at a record fair and bought both boxes. In the 1970s these boxes were inaccesible for me - now I have it !! (although I have the music in the boxes already on cassettes and CDs). Record collectors are weird !! Welcome on my web log. I will use it to share my admiration for jazz music, for my record collection and other jazz projects. I hope to meet other people who have the same passion.